Istres has a true historic centre that was previously fortified and built on a bank of limestone abundant in fossilised oysters. It was a small village perched on a rocky hilltop with rural Mediterranean-style houses around which the town of Istres was eventually constructed. So, in a green and flowery environment, magnificent sites, such as the old medieval centre with its rows of small squares, renovated façades and church, Chapelle Saint Sulpice exhibition centre and the Centre of Contemporary Art with prestigious exhibits line the city. Then, Istres is the historic birthplace of flight and aeronautics. The city developed alongside its Charles Monnier Air Force Base, a highly strategic and world-renowned site that plays an important role in the French Military Air Force and the city’s reputation and influence. Indeed, today the aerodrome of Istres, which is mainly used and controlled by the French Air Force, is an essential protection tool. The air force base of Istres, strategically set up in a remarkable setting, is an active site that is home to many operational missions, at the heart of the defence of France. To finish, Istres is also a city of water with its five large ponds and giant jet of water located in the Étang de l’Olivier, approximately 80 metres from the edge of the Bay of Castellan, which reaches a record height of 50 metres. It represents a giant liquid flag, symbolizing the ambition and vitality of an environmentally friendly and forward-looking city. A wonderful variety of cultural and festive events take place throughout the year : trade fairs, traditional celebrations such as the “Fête des Bergers” (Shepherds’ Festival), “Féria” (local bullfighting festival), St John’s Eve, the “Nuits d’Istres” (Nights of Istres) as well as many sporting events hosted by elite clubs. Apart from many shops in its town centre, Istres holds one of the largest markets of the region on Tuesday mornings selling fruits and vegetables, Provençal specialties, clothes, utensils and games. You'll find over 200 exhibitors at your service in the very heart of town. 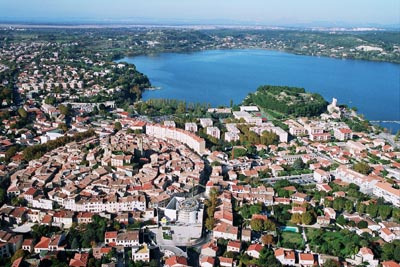 Istres has a Mediterranean climate characterized by mild, humid winters and hot, dry summers. As is so often the case, January and February are the coldest months, averaging temperatures of around 7 °C. July and August are the hottest months. The mean summer temperature is around 24 °C (75 °F) with an average maximum temperature around 32°C. The Mistral a cold and often violent wind, blows through the city mostly in winter and spring. To move in Istres, there are five bus lines (7,8,9,12,13) offered by “Ulysse” network, which appear also in 8 others communes. This network is used by more or less 170 000 inhabitants. © Traveltura 2010. All Rights Reserved.